1. What is concrete resurfacing? 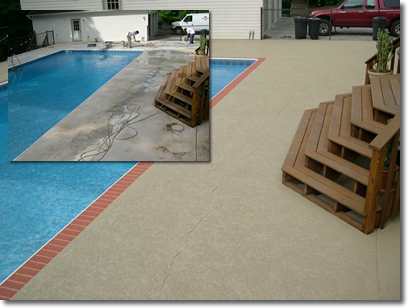 Concrete Resurfacing is the application of a modified polymer based cement over a prepared surface concrete. The final surface comes in many different patterns and textures and millions of color combinations. 2. What does it cost for an estimate? Estimates are FREE. We provide a written estimate which clearly explains what you have been offered and the final cost. The estimate will include a detailed explanation of what, if any, repairs need to be made prior to application. It takes approximately 30 minutes to measure and we will deliver a written proposal within 24 hours. During this initial meeting you will also see the 25 beautiful colors and the many decorative patterns from which you can choose. 3. How much does concrete resurfacing cost? Every job is different but the average cost for preparation and installation for resurfacing is approximately $4.00 per square foot for textured pattern and $5.00 per square foot for masonry patterns. 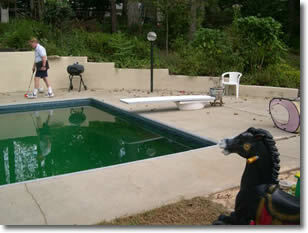 The cost of concrete replacement is more than 3 times the average cost of resurfacing. 4. Does Envirodek provide a warranty? Unlike the limited warranties provided by some companies that only cover materials, EnviroDek has a two (2) year warranty on installation an manufacture defects. 5. How long will the resurfacing last? The surface is a silica and quartz material, stronger than concrete and would last 10 to 12 years. You may want to re-stain in 4 or 5 years to keep it looking new. The surface is easy to clean and is pressure washable. 6. Is there a minimum temperature for application? Yes. The air and host surface temperatures must be at least 40 degrees Fahrenheit and rising to do the work. 7. Does the surface get too hot to walk on? No. Our colorseal is acrylic based, which makes it up to 60% cooler to the touch than plain concrete! Naturally, darker colors will heat up more than light colors. But compared to brick, tile, stone, or plain concrete, this application will provide superior heat resistance. And, it feels great to walk barefoot! 8. Can you apply over painted concrete? In most cases, yes! Some additional surface preparation may be necessary prior to application. 9. What about exposed aggregate or epoxy pea gravel surfaces? In most cases, epoxy pea gravel will need to be removed from the concrete, and the surface can then be prepared for an application. Exposed aggregate surfaces can be resurfaced with the proper prep work as well. Check out our photo gallery!